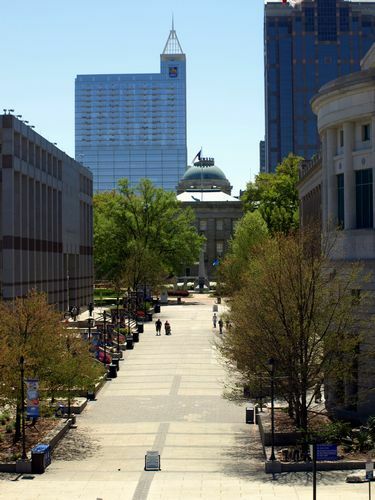 Raleigh’s Historic Capital District is the heart of North Carolina's political scene and a great place to learn about the state. One could easily spend an entire day touring the government buildings, admiring the beautiful architecture of many historic churches and buildings in the area, or walking through one of two comprehensive North Carolina museums. The State Legislative Building on West Jones Street has been the meeting place for North Carolina’s General Assembly since its completion in 1963. Members of the Senate and House of Representatives meet to create the laws for North Carolina. Once signed in, visitors are free to tour the building and outside roof gardens on the third floor. If the General Assembly is in session, spectators may watch deliberations through plate glass windows or enter the galleries, space permitting. Across the street is Bicentennial Mall, an open, no-traffic plaza that is home to the NC Museum of Natural Sciences,the largest natural history museum in the southeast. Visitors come from all over the world to learn about North Carolina’s diverse geography, geology, plants, and animals. On the opposite side of the plaza is the North Carolina Museum of History. Founded in 1902, it offers a variety of exhibits that explore and preserve our state, regional, and local history. A brief walk north in the plaza ends up at the North Carolina State Capitol building, a fine example of Greek Revival style architecture. This building is listed as a National Historic Landmark. 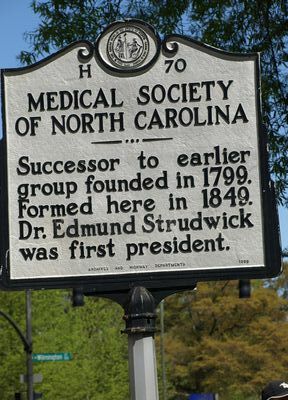 Several blocks away is the Executive Mansion, the place North Carolina's Governor calls home. Built between 1883 – 1891 by prison laborers in the Queen Anne style of Victorian architecture, its bricks were pressed at Central Prison in Raleigh and the interior is constructed with North Carolina hardwoods. Tours of the Executive Mansion are open to the public. Call for details. The Capital Area Historic District surrounds the Capitol building, including Edenton, Blount, Morgan, Wilmington, Salisbury, Hillsborough, and McDowell Streets and New Bern Ave. During weekdays, parking is on street, in lots, or parking garage. Travel Tip: Sunday is a great day to visit the area. The museums and Legislative building are open, traffic is minimal, and there is plenty of parking available. Buildings are wheelchair accessible. One of many historical markers in the area.